Here are some snazzy birthday facts about 19th of December 1967 that no one tells you about. Don’t wait a minute longer and jump in using the content links below. Average read time of 11 minutes. Enjoy! What day was my birthday Dec 19, 1967? December 19, 1967 was a Tuesday and it was the 353rd day of the year 1967. It was the 51st Tuesday of that year. The next time you can reuse your old 1967 calendar will be in 2023. Both calendars will be exactly the same! This is assuming you are not interested in the dates for Easter and other irregular holidays that are based on a lunisolar calendar. There are 241 days left before your next birthday. You will be 52 years old when that day comes. There have been 18,752 days from the day you were born up to today. If you’ve been sleeping 8 hours daily since birth, then you have slept a total of 6,251 days or 17.11 years. You spent 33% of your life sleeping. Since night and day always follow each other, there were precisely 635 full moons after you were born up to this day. How many of them did you see? The next full moon that you can see will be on May 18 at 21:13:00 GMT – Saturday. Fun stat: Your first one billion seconds (1,000,000,000) happened sometime on August 27, 1999. If a dog named Armanti - a Glen of Imaal Terrier breed, was born on the same date as you then it will be 224 dog years old today. A dog’s first human year is equal to 15 dog years. Dogs age differently depending on breed and size. When you reach the age of 6 Armanti will be 40 dog years old. From that point forward a small-sized dog like Armanti will age 4 dog years for every human year. Thomas Paine publishes one of a series of pamphlets in The Pennsylvania Journal entitled “The American Crisis”. American Revolutionary War: George Washington’s Continental Army goes into winter quarters at Valley Forge, Pennsylvania. Three Indian revolutionaries, Ram Prasad Bismil, Roshan Singh and Ashfaqulla Khan are executed by the British Empire. Nelson Rockefeller is sworn in as Vice President of the United States under President Gerald Ford under the provisions of the twenty-fifth Amendment to the United States Constitution. What does my birthday December 19, 1967 mean? 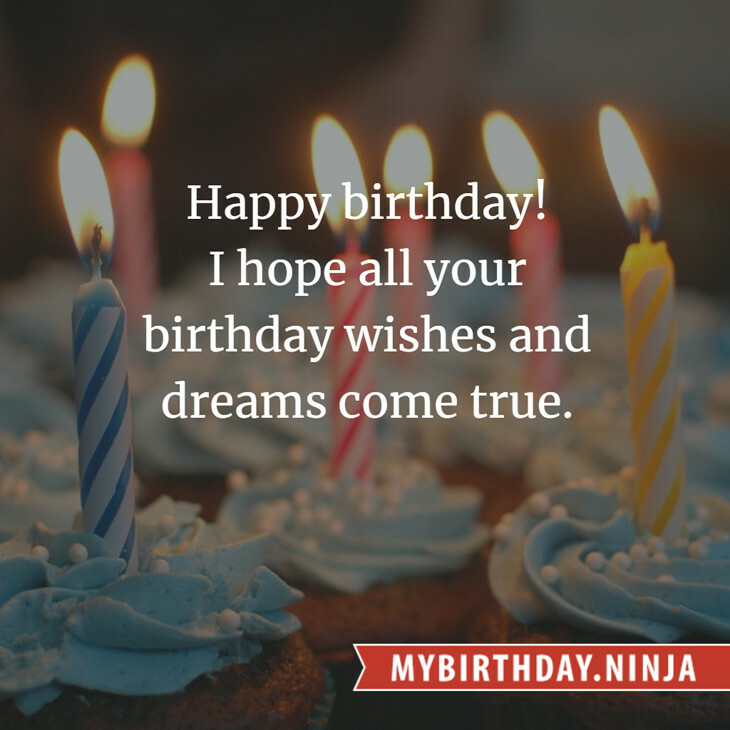 Your birthday numbers 12, 19, and 1967 reveal that your Life Path number is 9. It represents selflessness, forgiveness and creativity. You are the philanthropist, humanitarian, socially conscious, and are deeply concerned about the state of the world. The following celebrities also have the same life path number: Whitney Houston, Caterina Scorsone, Garth Brooks, Vicki Genfan, Dario Fo, Kirsten Dunst, Keiko, Bruce Davison, Rokurō Naya, Hwang Jung-min. What is the birthday horoscope for Dec 19, 1967? The Western zodiac or sun sign of a person born on December 19 is Sagittarius ♐ (The Archer) – a mutable sign with Fire as Western element. The ruling planet is Jupiter – the planet of luck and expansion. According to the ancient art of Chinese astrology (or Eastern zodiac), Sheep is the mythical animal and Fire is the Eastern element of a person born on December 19, 1967. 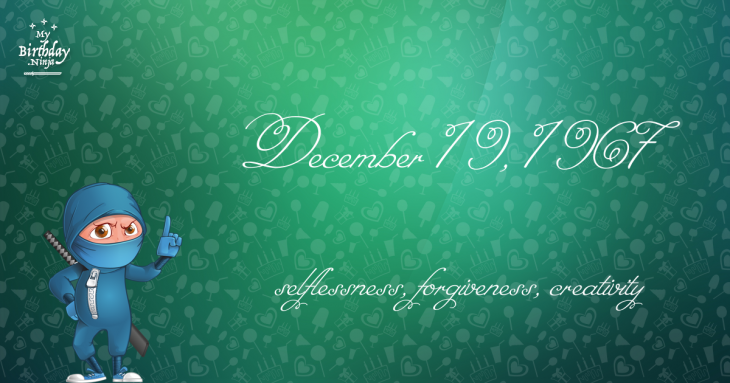 Fun fact: The birth flower for 19th December 1967 is Holly for precious moments. What is the Love Match for Dec 19, 1967? When it comes to love and relationship, you are most compatible with a person born on January 11, 1994. You have a Love Match compatibility score of +148. Imagine being in love with your soul mate. On the negative side, you are most incompatible with a person born on July 2, 1948. Your incompatibility score is -190. You’ll be like a cat and a dog on a love-hate relationship. Arf-arf, I want to bite you. Meow-meow, stay away from me! The number-one hit song in the U.S. at the day of your birth was Daydream Believer by The Monkees as compiled by Billboard Hot 100 (December 23, 1967). Ask your parents if they know this popular song. How many babies were born on December 19, 1967? Base on the data published by the United Nations Population Division, an estimated 119,222,142 babies were born throughout the world in the year 1967. The estimated number of babies born on 19th December 1967 is 326,636. That’s equivalent to 227 babies every minute. Try to imagine if all of them are crying at the same time. What is the popular baby name on 19 Dec 1967? Here’s a quick list of all the fun birthday facts about December 19, 1967. Celebrities, famous birthdays, historical events, and past life were excluded. Try another birth date of someone you know or try the birthday of these celebrities: February 20, 1985 – Julia Volkova, Russian singer and actress (t.A.T.u. and Neposedi); March 27, 1979 – Brook Silva-Braga, American director, producer, and cinematographer; December 20, 1986 – Anoop Desai, American singer-songwriter.